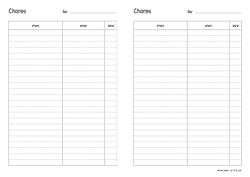 Print chores chart named 2x a4 paper for free. Chores named on an a4 size paper in a horizontal, landscape orientation. This sheet has 2 chore schedules to help managing cleaning activities for your kids of yourself.